Inder Loves Folk Art: Sewing comfy clothes for Joe. After I finished Maggie's Jump Rope dress, I was ready for a quick and easy project. Now that Joe is wearing pants almost every day (!!) he really needs more pants. 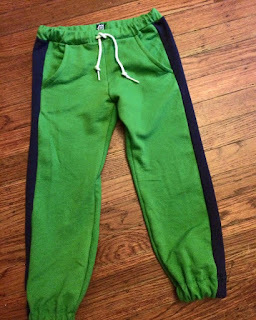 I couldn't bear the thought of buying him another pair of ill-fitting baggy Target sweats, so I whipped up another pair of Oliver + S Parachute Pants for him, using apple green and navy french terry from Imagine Gnats. Another great thing about this pattern is that it only requires a bare yard of 58" wide fabric in Joe's size. This fabric was $10/yard, so these are a pretty cheap make. Joe's favorite colors are "green and blue" - I really love the bright apple green shade of this fabric and it has a great medium weight. 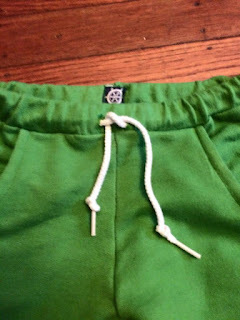 These aren't as warm as the sweatshirt fleece pants I made for Joe but I like the way the pants fit better in a slightly lighter-weight fabric. I really love this pattern! Once again, I made the size six, but removed about 3/4" from the rise and a couple inches from the length. I added pockets using the Sketchbook pocket pieces as a general starting point, and this time I did a drawstring as instructed. The drawstring is mostly for show, though, as the elastic is adequate to hold the pants up. 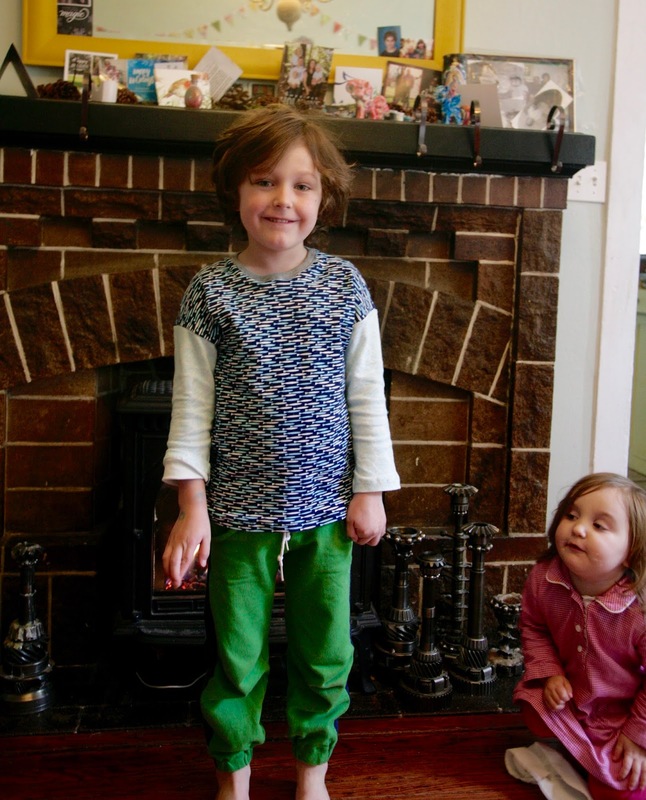 Again, trying to photograph clothes on wiggly children in low indoor light doesn't make for the best photographs. Especially when you have a photo bomber jumping into every frame! There's not much more to say about these sweats except that Joe needs a bunch more pairs of them! They are so much cuter and narrower than the store-bought ones he wears, and really easy and fun to sew! Seriously? A dirty paper towel on the floor? Argh! Well, his bottom looks really cute in these awesome-fitting pants, at least. After the pants, I whipped up another Ottobre 1/2015 #11 T-shirt. This is my fourth or fifth version of this pattern, and I love the boxy fit. This version features Cloud9 knits I picked up from Imagine Gnats - the sleeves are this pretty light blue hexie print and the body of the shirt is this "life aquatic" knit. I bound the neckline with gray ribbing, and hemmed the sleeves and bottom. Joe is average height, but a lot of his height is in his long torso rather than legs, so I always add a couple inches to shirts, and this was no exception. Looking at the photos, I could have lengthened the sleeves a bit more as well! The best part is that Joe loves these new pieces and chooses them frequently from his bins! Score! Fab pants, I love the colour. Thanks for all the details regarding the fit, very helpful. I am glad your phone is okay, Jed is a serial killer of phones too, he has run them over with tractors, baled them and dropped then in troughs and randoms paddocks. I have not ever joined in KCW, I love the concept but it never works with my schedule. I really like the apple green pants, and the mix of fabrics you used for the top. Joe looks so happy and cosy in his new outfit. I'll sew something for KCW although the timing's not ideal for me either, but since I'm always sewing stuff anyway, I might as well join in! Green and blue are two of my favorite colors too! Great looking sweats and cute shirt. And joe looks really happy and comfy in his mom-made clothes. Love them! The green is such a great shade. I have my eye on this pattern. Yay for soft pants! I always learn a lot from your write-ups. Oh, I love the color of those sweatpants! And the pockets. Perfect! The mix and match tshirt is great too. I should embrace that approach more, as I have such a mishmash of leftover knits!